Welcome to this month’s Blog from the LivOliv Nail Desk…. Now the summer holidays are pretty much over, it’s a great time to get into a better routine of self-care which we of course think should include a regular manicure! 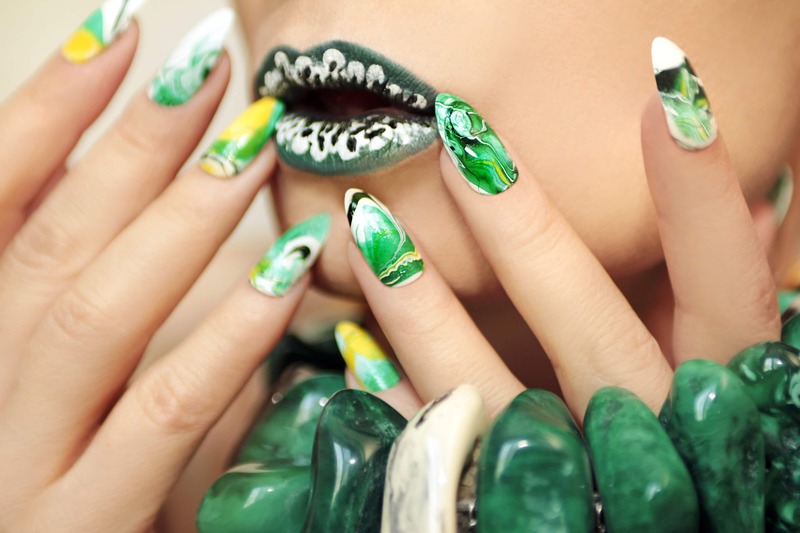 So if you fancy changing up the look of your nails, why not try growing them into a new shape? We have all the info you need below! Do you Square, Oval or Squoval? Almond or Stiletto? Or dare you Coffin? Trends for nail shapes come and go, but there are a few which are classics or trends which seem to be going nowhere, so today we’re giving you our top tips on how to achieve 5 of the most popular! ‘Square’ nails are the best shape to start with if you need to keep your nails short for work or are just beginning to grow them. They are super simple to do, all you do is leave the sides of the nails as they are and file the tip into a straight line. If your nails are very short it may take you a while to get to the point of being able to do this, but it gives a very neat and tidy look to your fingers and looks fantastic with super sparkly polish! If you like to wear your nails longer, the sides of them can become vulnerable with this shape, so an oval or almond style may be better if you prefer to wear yours medium to long. It’s generally easier to maintain longer, natural nails with the more traditional ‘Oval’ shape because it’s the hardest wearing as the sides of your nails are less vulnerable to wear and tear. When filing, make sure the sides of your nail are straight and even to begin with, then start filing inwards with an arching, smooth motion. This shape is the most classic and very chic, which looks lovely with a French Manicure. ‘Squoval’ nails are a slightly trendier and sharper take on the traditional Oval and look fabulous on shorter nails, so if you are only just beginning to grow yours, this is a great shape for you! This type of nail shape tends to look nice with any colour polish, but we particularly like them in bright pastels or dark dramatic shades. It’s a very easy shape to achieve and maintain. For a square base with an oval edge, all you have to do is file the tip of your nail flat and then gently round off the corners. * When filing remember not to use a continuous, sawing motion as this can weaken the nail – do it one stroke at a time, lifting the file away from your nail each time. 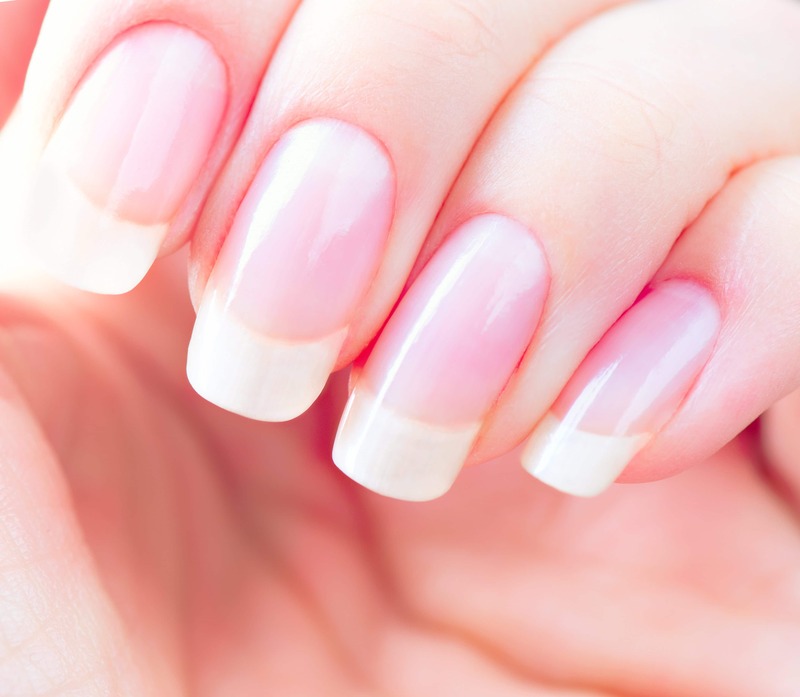 If you like to wear your nails really long, the sides of them can become vulnerable with this shape, so an oval or almond style may be better if you prefer to wear yours medium to long. ‘Almond’ nails are very flattering as they elongate your fingers. 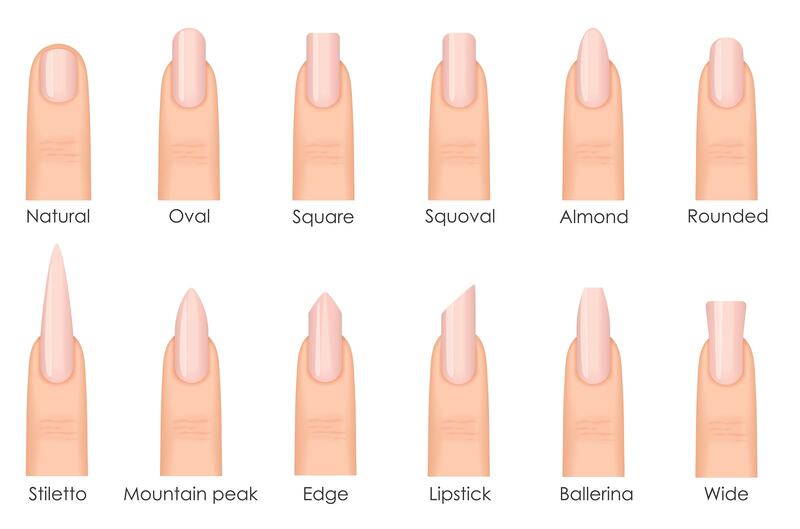 For a true almond shape, you need to start off with nails which are square when they are short, to have a nice strong base for the more pointed shape at the tip. As your nails grow, file them to an oval shape at the end initially and then when you are happy with the length, take them thinner and more tapered to end up with an almond tip. *When going from oval to almond, you need to do so quite accurately, to make sure your fingers end up looking symmetrical – so go carefully as you shape them as you don’t want to over file! A high fashion, ‘Coffin’ (sometimes also referred to as Ballet or even Stiletto) shape is really only for people with long, very strong nails or for those with gel extensions. They are basically an elongated almond shape with a flat or very pointed tip. 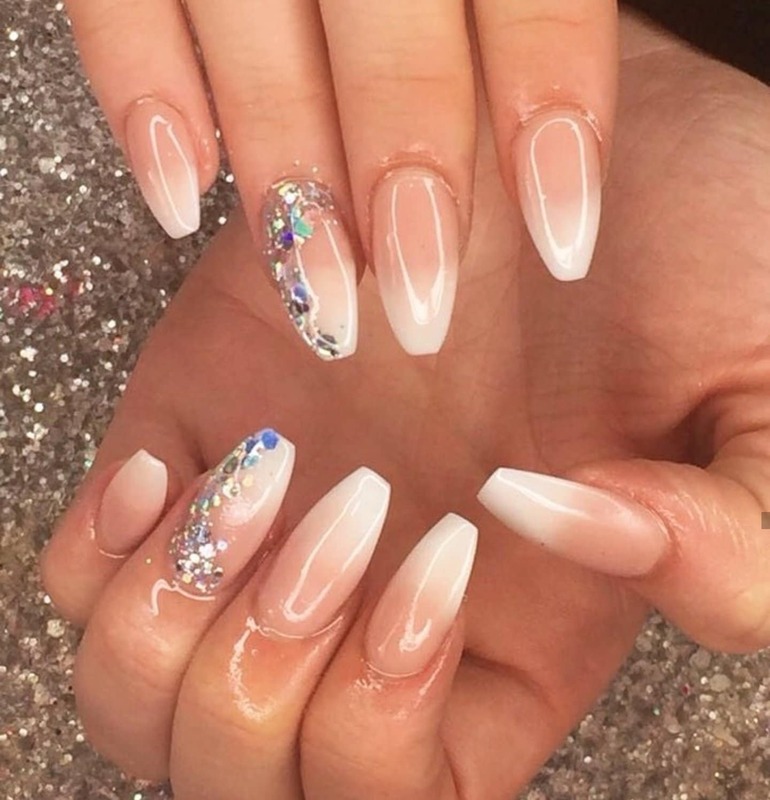 To achieve this look you need to follow the same process as per the almond shape, making sure you have a strong square base but then take them right in, narrower at the end and file the very tip of your nail straight for the Coffin shape or meet the sides into a very sharp point for the Stiletto. *Make sure you focus on curving each side evenly into the centre to get that sharp, teardrop shape. These shapes are much more prone to breakage, so are probably not practical for day-to-day wear if you have natural nails, but with some knockout holographic glitter polish, they look very striking for a party! Did you know that we have a team of specialist nail swatchers? Lovely ladies who have a passion for polish and are kindly demonstrating our range of colours! According to Harper’s Bazaar (http://www.harpersbazaar.co.uk/beauty/beauty-shows-trends/news/g37623/a-w-17-nail-trends/), pretty much anything goes fashion wise for nails right now, with the catwalks showcasing a surprising amount of natural/bare look nails with just clear or very sheer and classic, pale pinky nudes… right through to high fashion looks of hand-painted, graffiti-like logos, dark metallics and bold, bright reds. As we head into the cooler months, try to use a Hand Cream and Cuticle Oil on a regular basis to feed your nails, as this is where better nail growth and strength really starts – plus the moisture keeps hands looking more youthful! Check out our 23 Tips for Beautiful Hands and Nails blog , or downloaded our free Nail Care ebook for more info. We are also currently working with Becky to design a special Autumn colour collection that will be announced very soon! As always, if there is a particular colour you would like to see added to our range or a nail care question you’d like answered, please get in touch as we always love hearing from you! Enjoy the end of the summer and most importantly, Liv…Happily! ← The Top 5 Autumn Trends and How to Style Them!